This week I had the pleasure of visiting Humboldt Park, a predominately Puerto Rican community on the West Side of Chicago. Humboldt Park was named after Von Humboldt, a European explorer, naturalist, and originator of plant geography. This whole community is painted with Puerto Rican flag colors. This is a beautiful display of social capital. The sixty foot flags at Division and Western are cultural structures of hope. Teenagers and children will use these images as inspiration to beat back the demons of hopelessness and shake off the demons of lovelessness that plague so many Chicago communities. But a chain is only as strong as its weakest link, and Chicago is only as strong as its most under-served community. 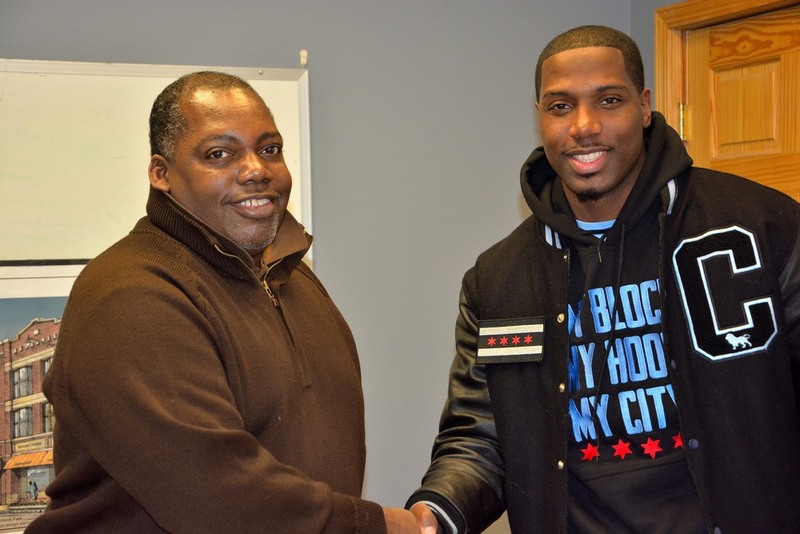 I decided to stop by and speak with Chet Jackson, Executive Director of the West Humboldt Park Development Council. Mr. Jackson is a very knowledgable person. We spent the majority of our time talking about the teenagers in Humboldt Park and how there's a wide spread tendency to view teenagers as throwaways. Mr. Jackson sees opportunity in the eyes of the disadvantaged. He says, "Clearly, drug dealers have the capacity to learn. It's just the activity they're involved in is disgusting. There's a real need for Intense Mentoring in the Humboldt Park Community." After speaking with Mr. Jackson I decided to stop by and talk with 26th Ward Alderman Roberto Maldonado. At the beginning of our meeting I joked that he had more waves in his hair than I do. We shared a laugh. Alderman Maldonado came to the US when he was twenty-seven years old. We talked mostly about the history of gentrification in Chicago and its impact on the Puerto Rican culture of Humboldt Park. Alderman Maldonado says the only way to preserve the culture of a community is to make sure residents have affordable housing in the community, so that those that live there on a "rental basis" can remain living there. This effort has to be coupled with middle class Latinos buying their homes in Humboldt Park instead of Gated Communities. Alderman Maldonado is a wise person. I enjoyed our conversation. Speaking of young middle class Puerto Rican's, I met up with my friend Adrianne Segura, an advocate for Education Reform at the Noble Network of Charter Schools. Adrianne and his wife live right behind the Alderman's office. He told me to meet with him at La Bruquena, for authentic Puerto Rican cuisine. I don't know what I ended up getting, but I got a lot of it, and it turned out to be pretty good.